An opening reception will take place on Friday the 26th of January from 5 – 7 pm. The exhibition will run for two weeks from the 27th January – 8th February. Inspired by an allegorical literary work ‘Labyrinth of the World and Paradise of the Heart’ by the 17th-century Czech scholar John Amos Comenius, this collaborative exhibition examines the concept of home as a safe place for personal development and self-expression. In the exhibition, the artists respond visually to this allegorical work and bring its subject matter into the contemporary context of Cork city. In the disused residential accommodation inside the grounds of Elizabeth Fort, the artists create an immersive installation in which the environment of the uninhabited domestic setting becomes an integral element of the work. 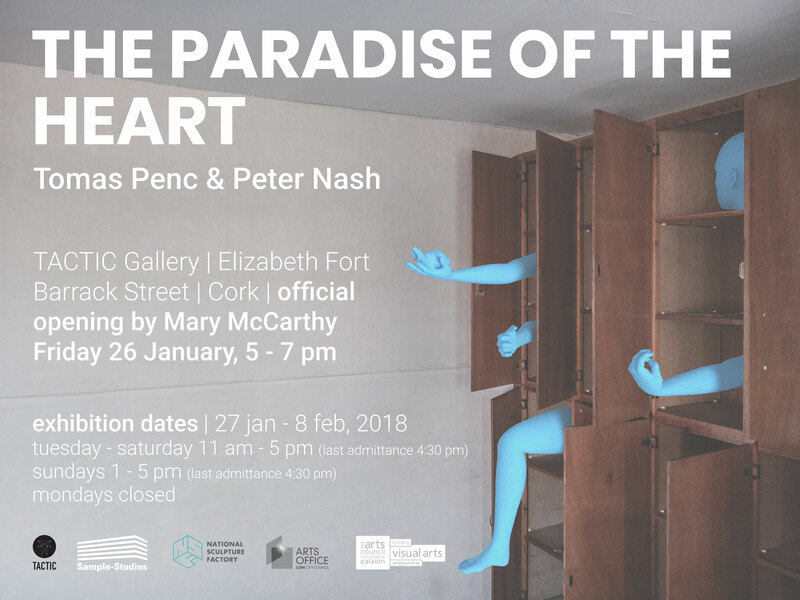 The Paradise of The Heart is a collaborative exhibition by Cork-based artists Tomas Penc and Peter Nash. The project is hosted by TACTIC Gallery and supported by the National Sculpture Factory, Cork City Council and Sample-Studios. The approach to his work is open-ended and idea driven, the resulting artwork is usually project based and often site-specific and takes form of sculpture, new media projection and interactive installation. It is embedded in an engaged conceptual and material research with emphasis on human behaviour seen through psychoanalysis, existentialist and eastern philosophy. It is concerned with the unresolved relationship we have with present day technology and the possibilities of transcending these ethical and moral challenges. Peter Nash is an artist originally from Carlisle, Northern England currently based in Cork city. He obtained a BA Honours Degree in Fine Art (Sculpture) from Sheffield Hallam University, England in 2003 and graduated in 2016 with an MA in Art & Process from CIT Crawford College of Art and Design, Cork, being awarded the one year Graduate Residency Award upon completion of the course. Nash’s practice holds drawing, animation and sculptural assemblage elements that converge to form tangible thought structures. He investigates our current era of rapid digital evolution where access to a world of information via the Internet has rendered facts instant and disposable. His works are an exploration of human fallibility in an age of digital perfection, mistruth and increasing automation.